Before moving forward on that beautiful swimming pool you’ve fantasized about installing for ages, it’s imperative to meet with and obtain quotes from several pool builders. Otherwise, you may not be getting the best deal (which doesn’t necessarily mean the lowest cost — be sure to think through quality of craftsmanship, design expertise, warranties, customer service, etc.). And in order to know if you’re receiving the best value, you’ll need a full understanding of the price tag — including what is and is not covered. Be sure to look for the same items across the board, as you meet with prospective pool builders, to ensure you’re comparing apples to apples. While many companies are above board and truly want you to understand the contract you’re signing, others may try to gloss over charges or downplay fees in an effort to win your business. Obviously, a large hole will need to be dug out in your backyard to make room for your new pool — but where does all that dirt go? Your options include spreading some or all of it around your yard and/or hauling it off your property to be disposed of. Make sure you discuss which option works best for your situation and that it’s accounted for clearly in your proposal. Your new pool or deck may require the structural support and yard drainage retaining walls can provide. A quick way to assess: If your yard slopes, it most likely needs them; if your yard is reasonably flat, it may still need them. And retaining walls can be very pricey. Make sure your pool builder understands the landscape and includes this cost in the estimate — if you don’t end up needing it, you’ll recoup some money, which is better than not including it and finding out it later. Pumps, lighting, additional outlets, salt chlorine generators, hot tubs, automatic covers and heat pumps — what do these all have in common? Sure, they all make owning and maintaining a pool so much more convenient, but they also run on electricity. Some pool builders will include electrical work in their bid, and others invoice it separately because the work involved varies greatly from one project to the next. While either approach is fine, it’s important to pay attention to those details when comparing bids. Whether or not you have young children isn’t the only consideration for deciding to install or forego a fence — it may be required by your city or state and/or your insurance company. Your pool builder should be familiar with local legislation and guide you toward the appropriate solution, including any associated costs in their quote. If you’re building a pool, chances are you’d also like a nice patio area on which to place your lounge chairs, patio furniture and grill. If that’s the case, it’s imperative to discuss your options ahead of time, including whether it will require additional concrete or materials such as tile or travertine. Either way, make sure your pool builder includes your preference in their bid. It’s likely that this construction project could damage and even ruin a portion of your current landscaping, including grass, flower beds, and sprinkler heads. Also, if your main entrance to and from the construction site is your driveway, the sheer weight of the bulldozers and other heavy equipment could crack or damage it. Be prepared for this chaos and anticipate extra costs to seed or replace grass and repair or replace your driveway. You may also want to consider investing in more extensive landscaping such as decorative plants and rocks around your deck and pool to further enhance your new space. Nobody likes financial surprises midway through a construction project. 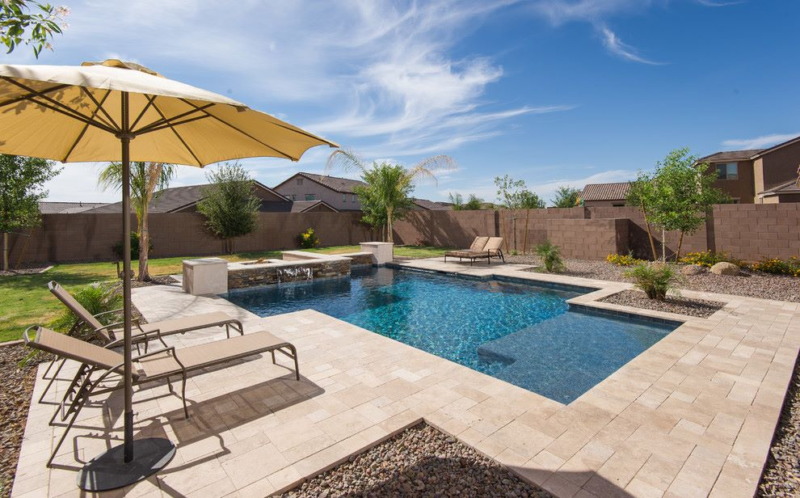 Once you know to look for or inquire about the aforementioned items on the proposals from your list of prospective pool builders, it will be much easier to envision your true cost for the project and plan your budget accordingly.